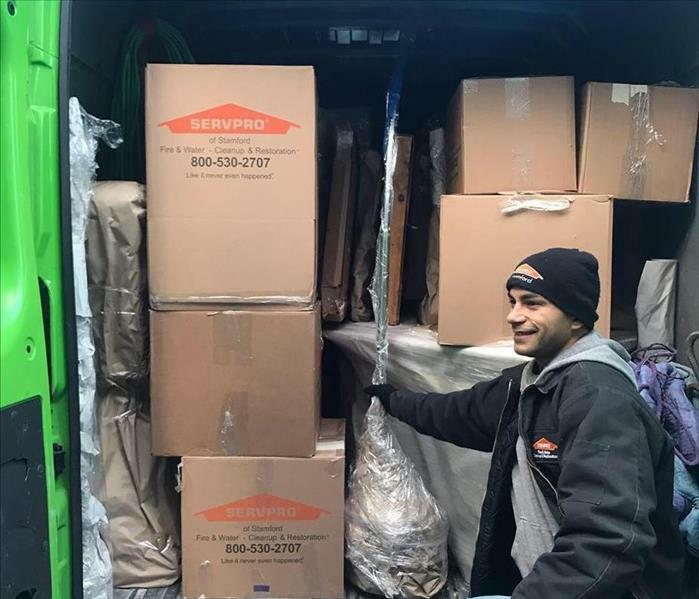 Our pack-out service is a benefit that our customers get. Our crew wraps and boxes your possessions and bring them to our facility. We have plenty of space to safely store your belongings while your home or business is being restored to its previous condition. We have access to the best equipment that allows us to handle all jobs, no matter the size. Luis is setting the hoses so that drainage occurs properly at a home with over a foot of water in the basement. Our awesome crew member Roberto doing what needs to be done. 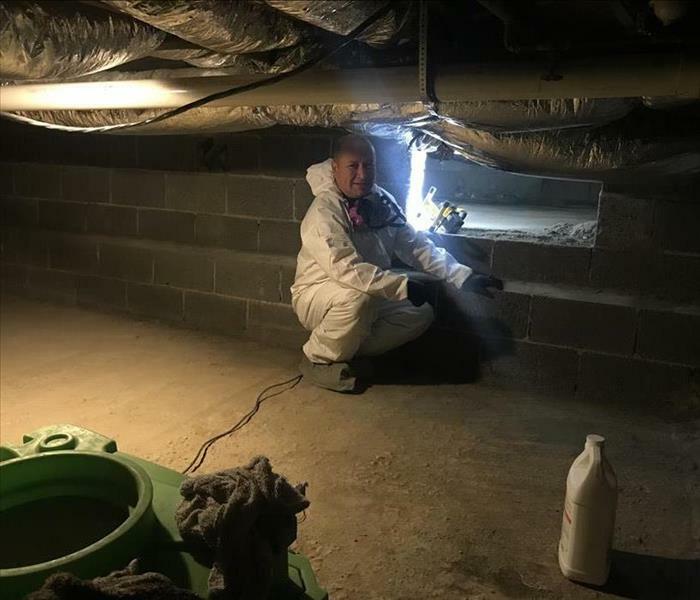 He’s down in a crawlspace removing animal waste and odor, making the customer happy. He, as well as our whole crew, really care about helping people every day. 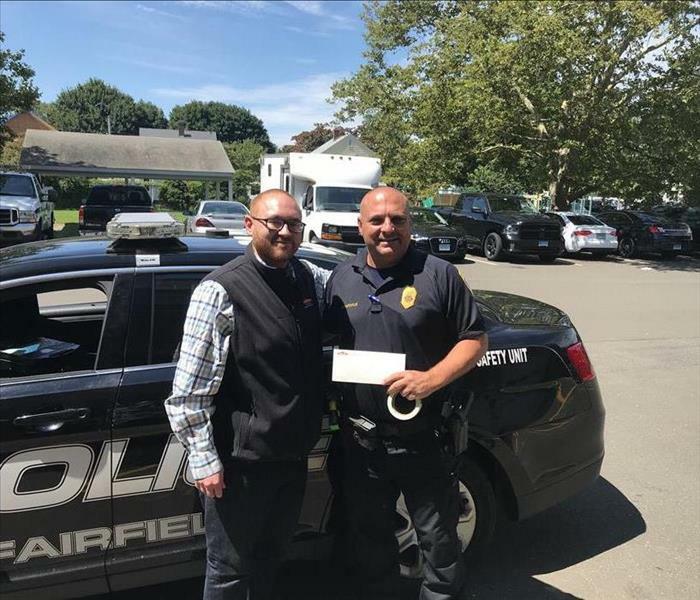 Andrew from our marketing team posing with the local police. This is after we donated to their fire education program, which allows them to provide information to young people to keep them and their families safe. Our team has the ability to offer a full spectrum range of services that will make your experience as comprehensive as possible. Our board up service is one that is offered when a fire occurs. It protects your home or business from the elements while repairs are being done. Our dry ice blasting service is something that sets us apart from our competition. It is a highly powerful machine that cleans better than power washing on some surfaces. 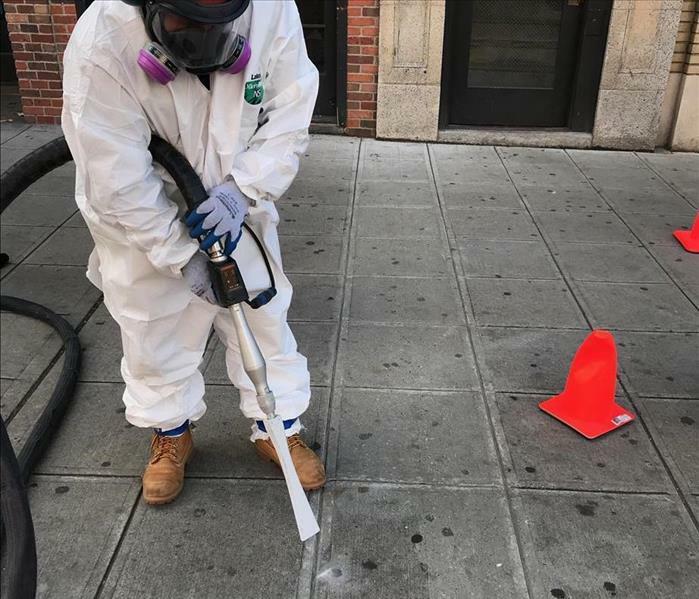 Here we see gum being removed from the sidewalk. 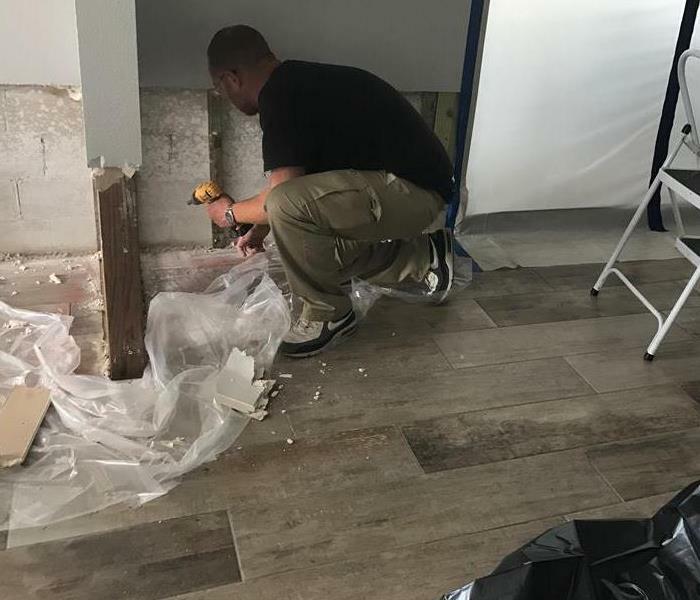 As a result of some recent rainfall, the water level rose and seeped into this basement while the homeowners were on vacation. When they returned, the floor had begun to rot, and needed to be removed. 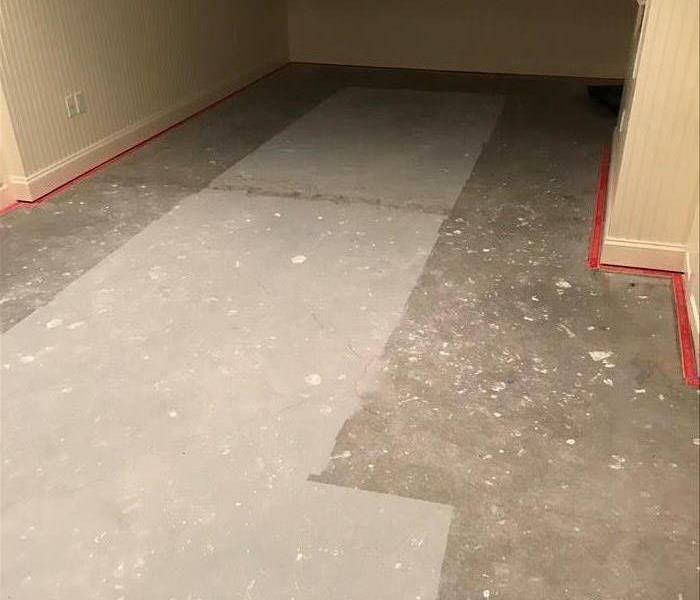 We extracted all the flooring, and dried out the entire basement. When a storm hit this home, the water came into the house, much to the dismay of the homeowner. The carpets were removed to be cleaned and deodorized at our facility. 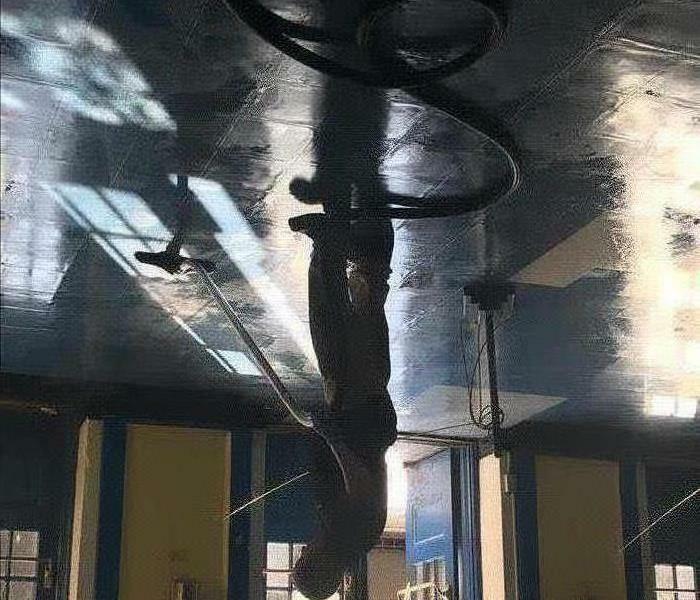 All water was extracted and the floor was dried. After this picture was taken, the carpet was reinstalled successfully. 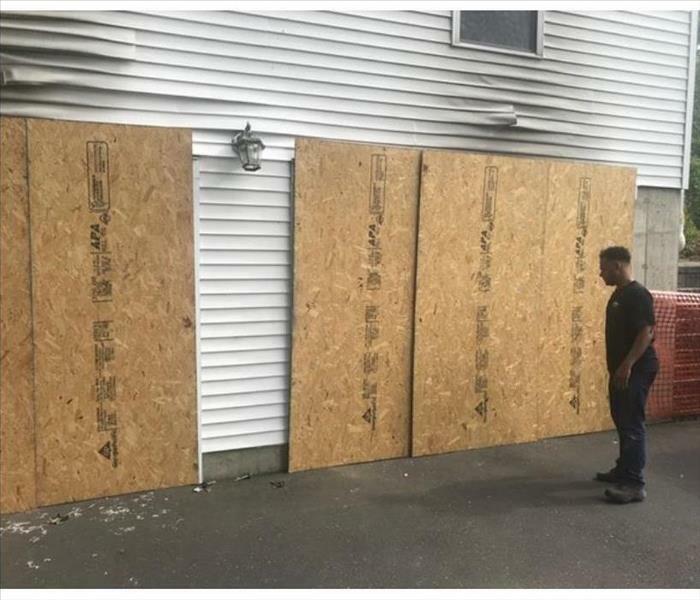 When a wind gust broke the windows at this small office building, SERVPRO of Greenwich was there to help with one of the services that we offer. 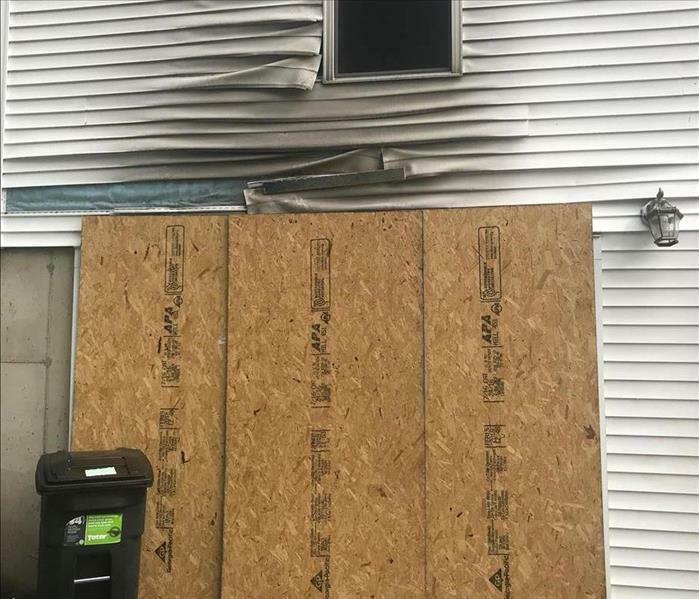 Boardups are a crucial part of the process, ensuring that when a window or structure is compromised, no more outside factors will cause damage. 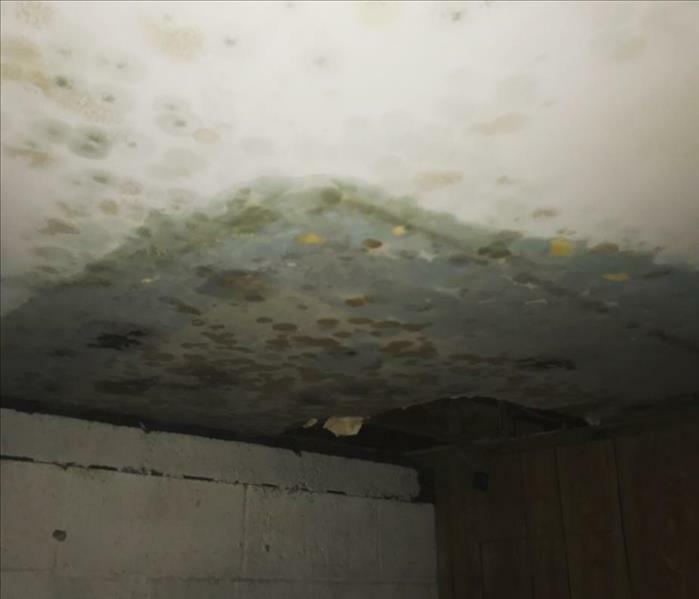 SERVPRO of Greenwich responded to this mold damage, where all food in a refrigerator had gone bad. The food was removed, all affected surfaces cleaned and sprayed with antimicrobial solution, and the customer was left satisfied. This is a law office that found some mold in their basement. 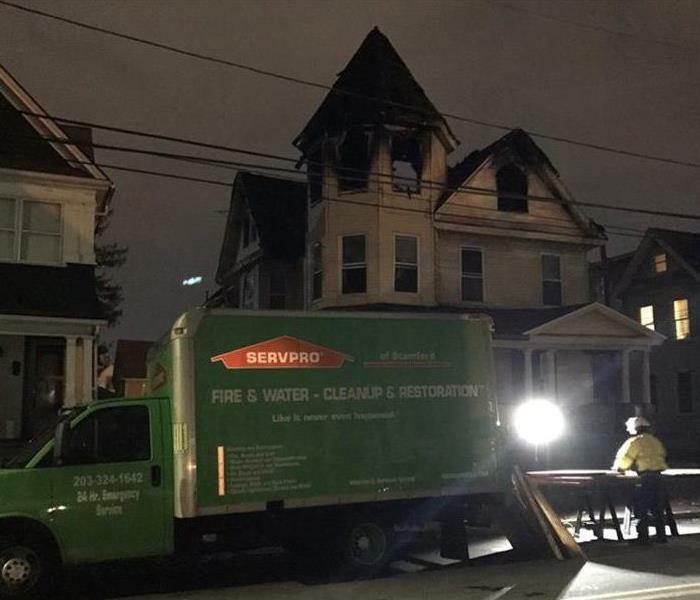 This picture shows how SERVPRO of Greenwich contains the affected area, allowing business to continue around the issue, all while making it a safe environment to do so. One of the preventative services that we provide is known as our Emergency Ready Profile. 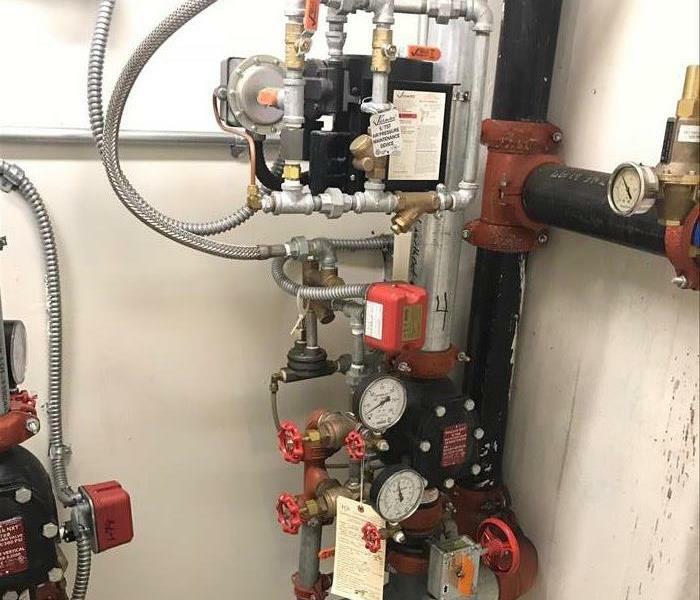 One of our skilled technicians takes note of all important utilities and controls in the building, such as water, sprinkler, gas, etc. Then, we compile all the information into a report that gets delivered to you, and even given to first responders. This program ensures that in the event of an emergency, everyone can respond in a timely and effective manner. 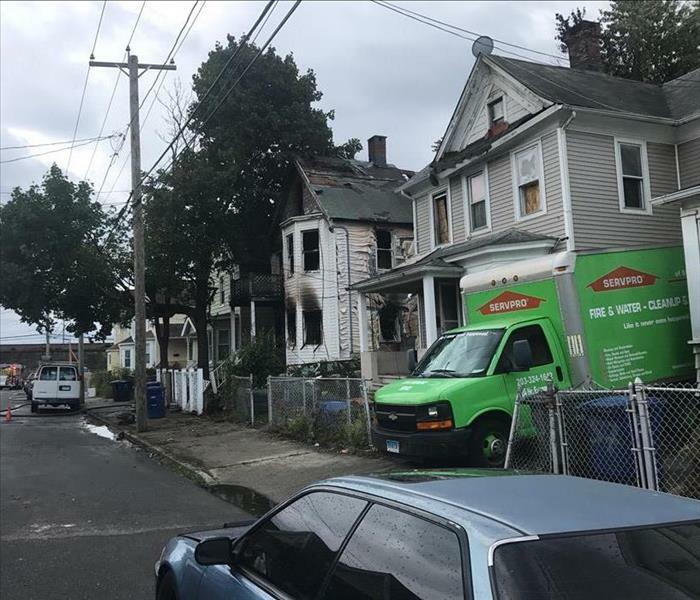 Fire in a residence that SERVPRO of Greenwich was called to. We responded in the middle of the night. We will be packing out contents, deodorizing, and cleaning. All services that we provide each and every day. This was the aftermath of a burst pipe that was not properly taken care of when it initially happened. 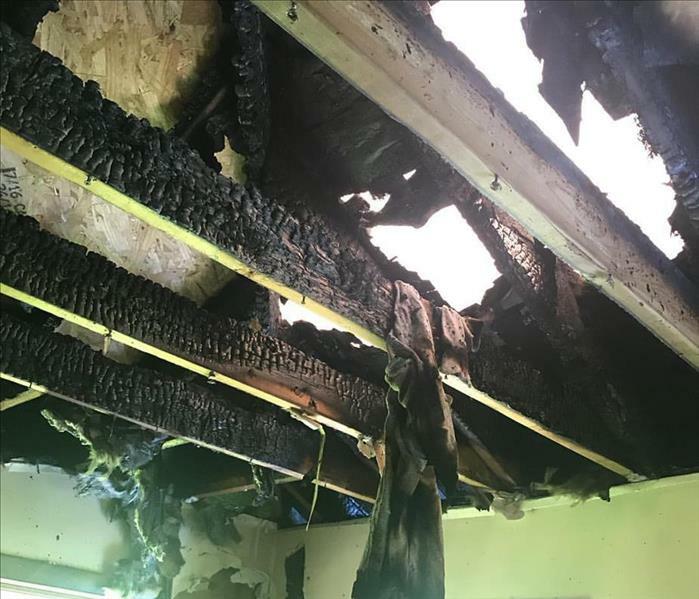 The occupants tried to take care of the problem on their own, but did not fully dry out the floor above, so moisture remained. 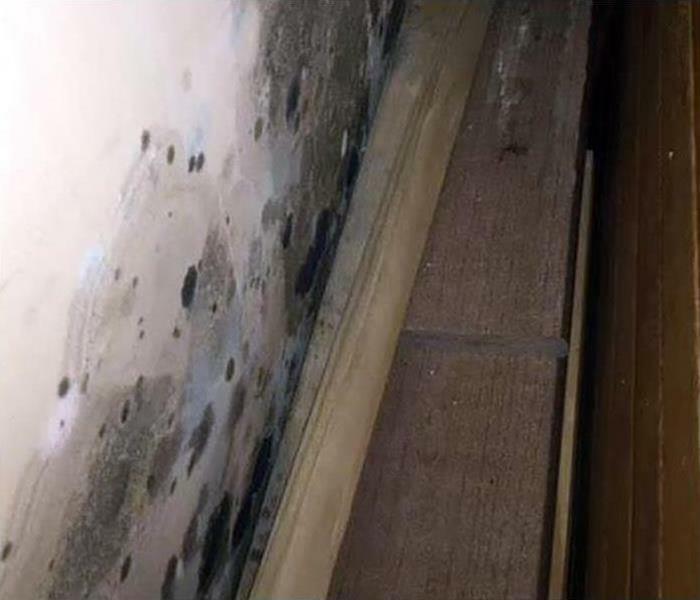 An immense amount of mold grew, and we were called in to remove the issue. 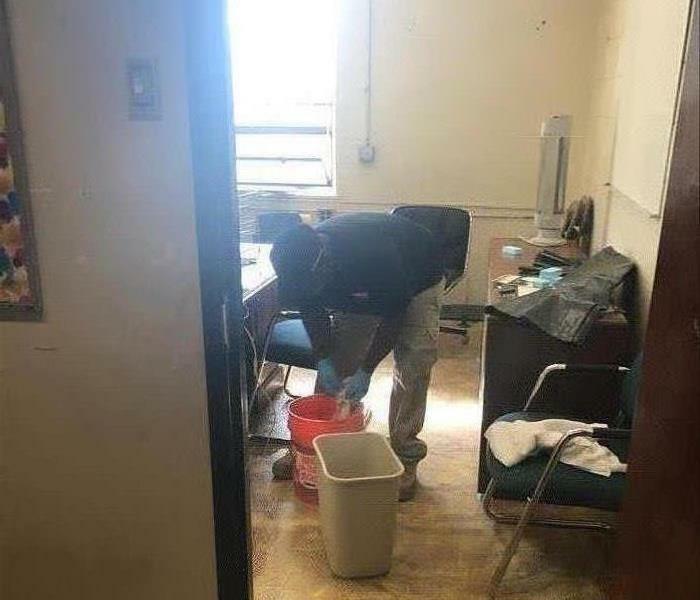 This municipal building had a burst pipe that spewed water until someone was able to get to the shutoff. We go on scene and began to extract the water so that the drying process could begin. When a large scale water damage occurs, we bring out the big equipment. 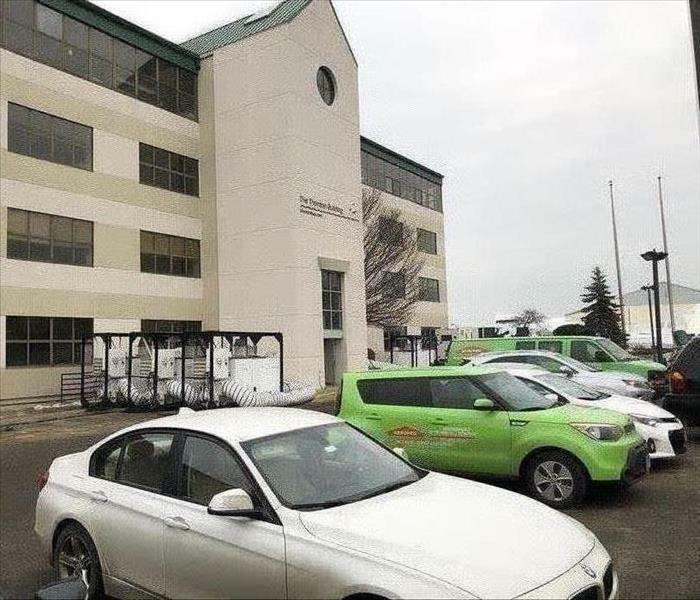 This piece is called a desiccant dehumidifier, and it is able to tackle large building such as this one. 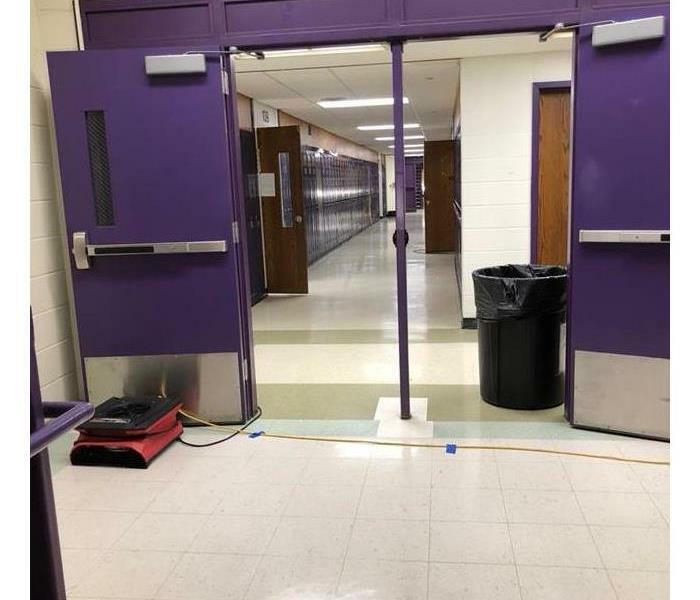 This school had water damage that spanned multiple classrooms, as well as in the hallway. 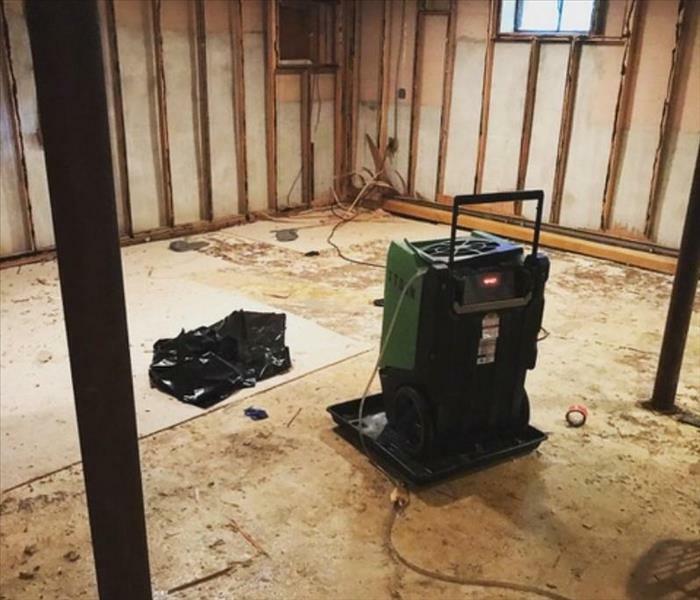 SERVPRO extracted all the water, dried the affected area, and cleaned the dirt that was left by the water off the floor. When water comes into contact with any wall material, we need to make sure that the material has not soaked up any moisture, and also that water is not lingering inside the wall itself. Storm damage caused a faulty room to let water into this house. 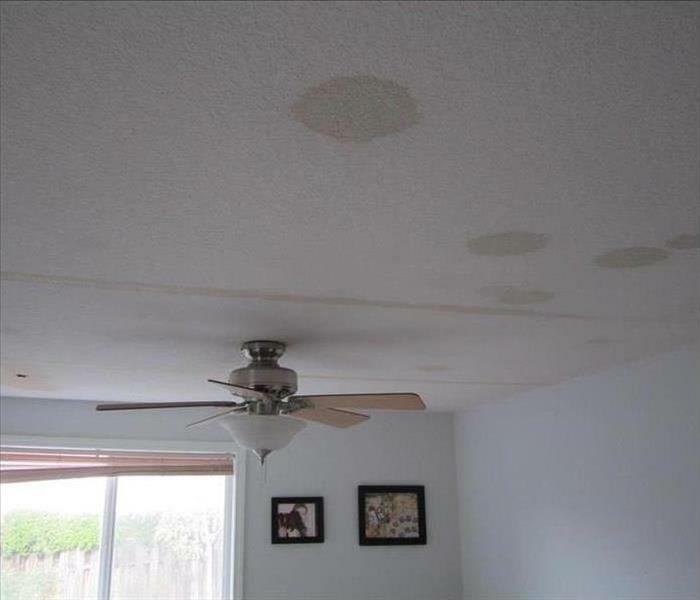 The customer called SERVPRO after noticing the water stains on her ceiling. 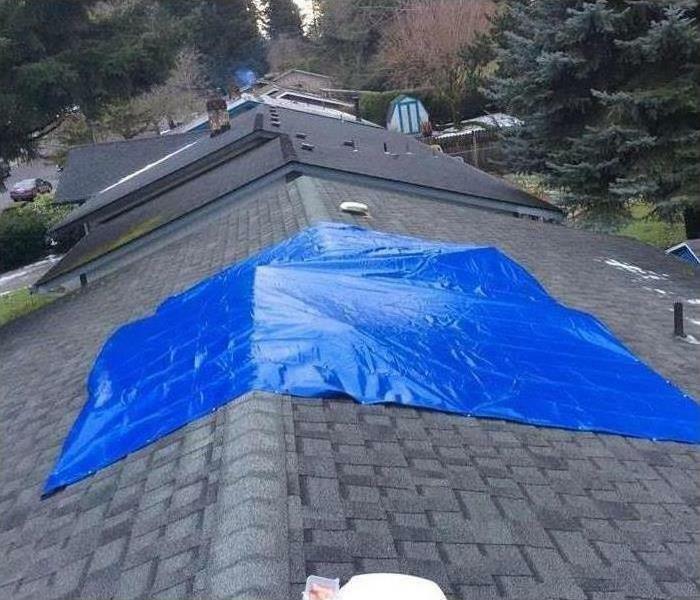 We were able to dry out her attic and repaint the roof. water to come in. 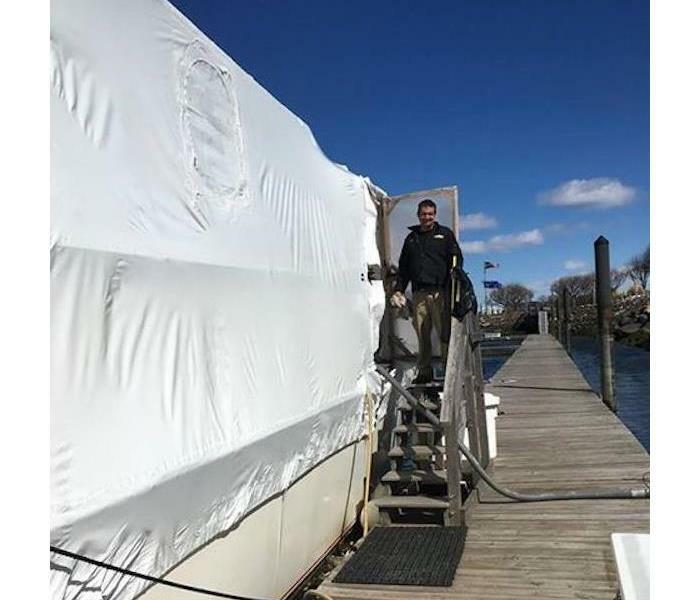 Once on scene, SERVPRO quickly installed this tarp to stop anymore damage from occurring. 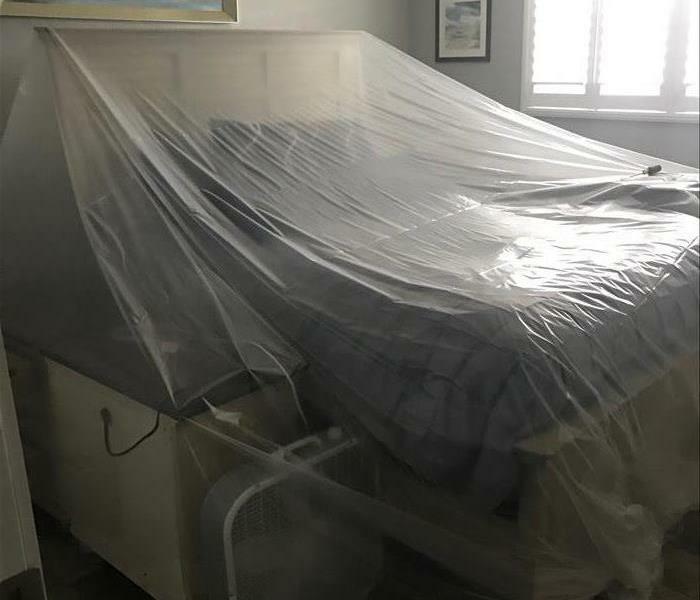 A roof leak caused by excessive rain caused this bedroom to become damp. One tactic we use to battle water is to contain individual pieces of furniture to dry them out completely. A window that was accidentally left open during a rain storm allowed gallons of water to flow into this office building. 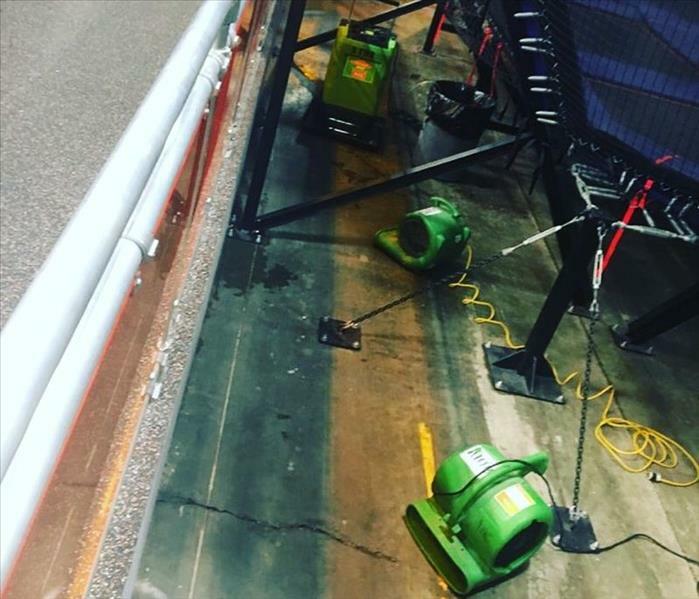 SERVPRO is adept at handling emergency damage that comes as a result of storms. Here is some black mold inside a wall in a house that SERVPRO was called into. We removed the affected drywall, installed new material, and sealed the area so that no new growth was possible. Drywall can act like a sponge, soaking water up into itself. 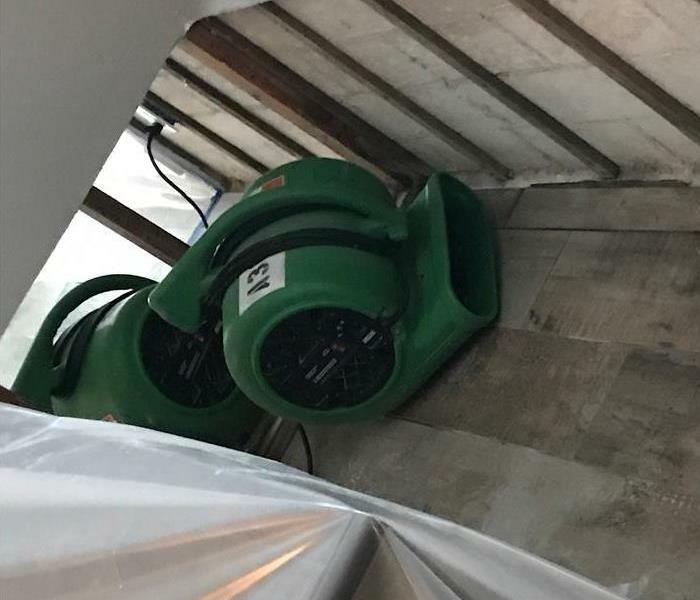 These fans have been placed directly next to the affected areas to ensure a complete drying. This way, no mold will have the chance to grow. 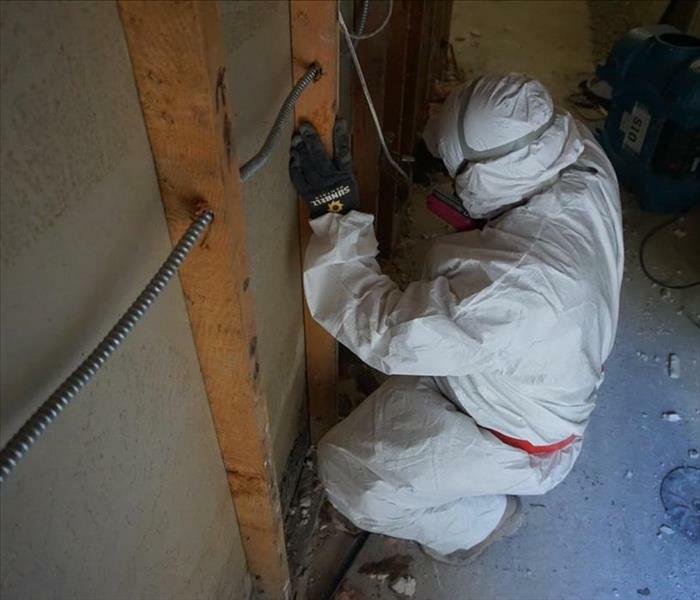 Andrew is seen here removing the bottom portions of drywall all the way around the perimeter where a water loss occurred. We remove affected material so new drywall can be installed. 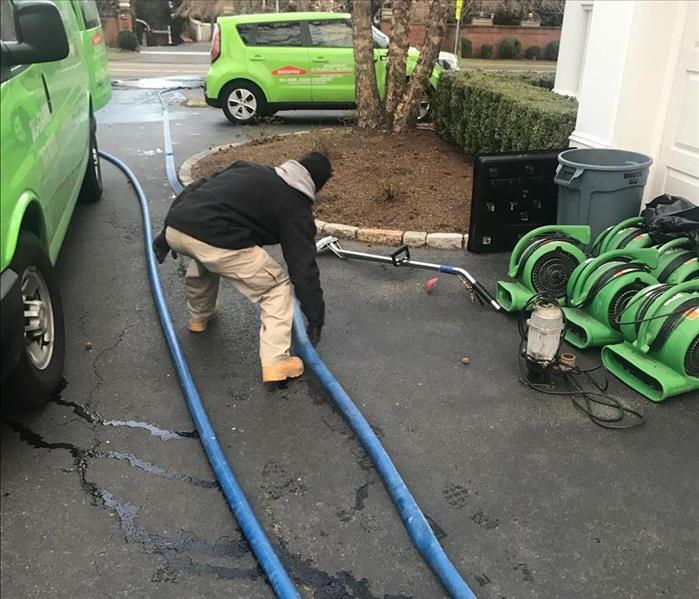 After a large water main break at this corporate building, we pulled all of the visible water out. 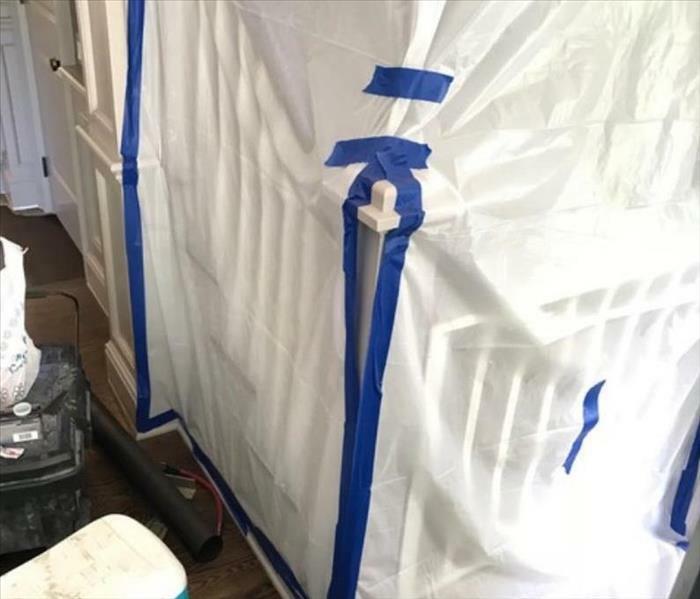 The fans help dry the water we cant see so that mold does not begin to grow behind the walls or in the floor. 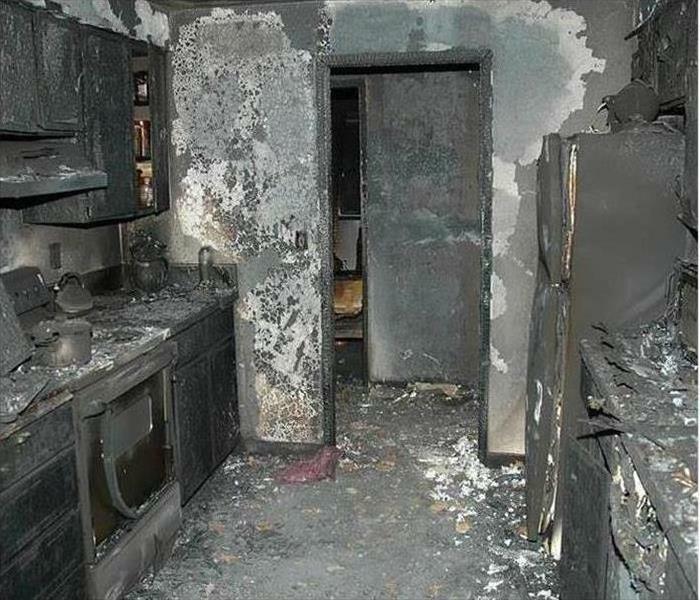 This apartment in a high-rise building also suffered a kitchen fire, but the fire was contained to only a few units. 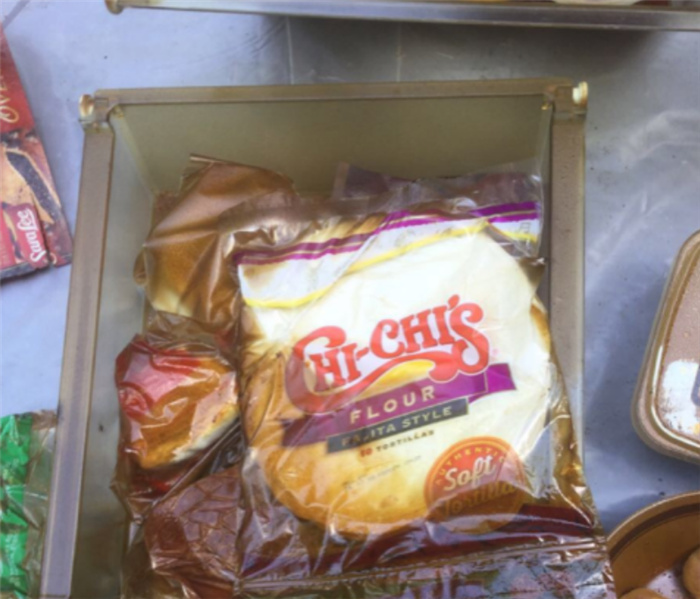 Sometimes we are able to save items within the home, but this time, it was a total loss. The house in the background caught on fire as a result of a kitchen fire. The fire spread to multiple units within the building. SERVPRO was there within the hour to begin work. 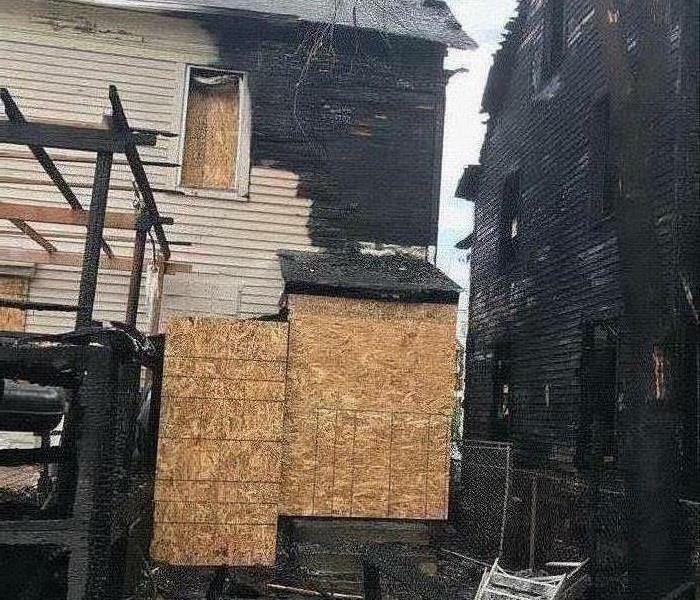 This is the aftermath of a house fire that we were called to work on. In addition to cleaning and mitigation, SERVPRO also specializes in board-ups and other post-emergency measures. After a fire, all affected material must be removed. 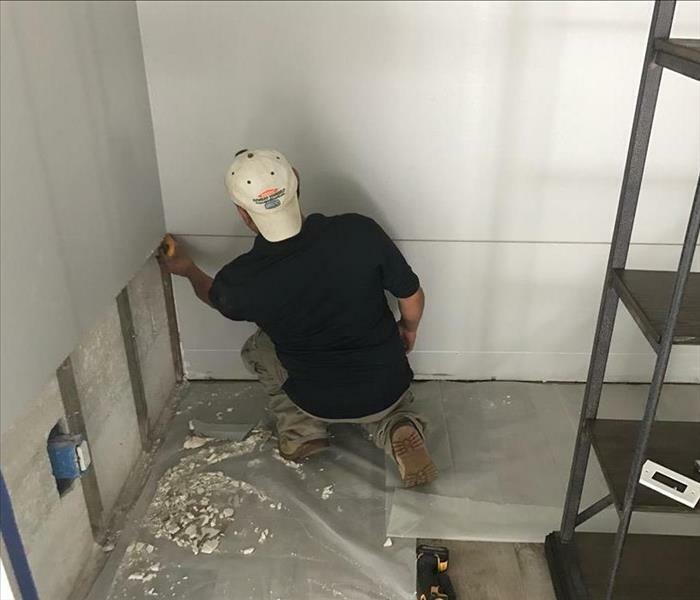 Here we see one of our skilled crew members removing drywall, so that we can begin reconstruction of the interior walls with fresh material. 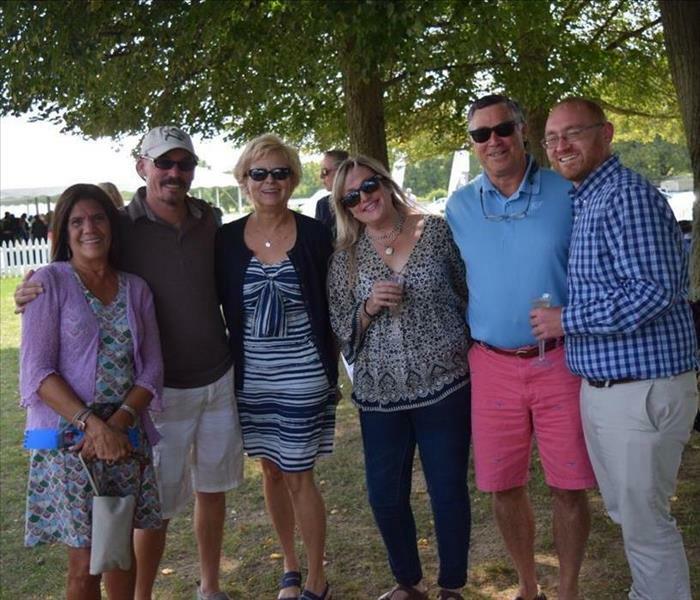 Andrew (far right) and Dodi (middle) enjoying the sun with some of our friends and partners at the Greenwich Polo Club this summer. The polo club is always a great time for us, as well as our guests. 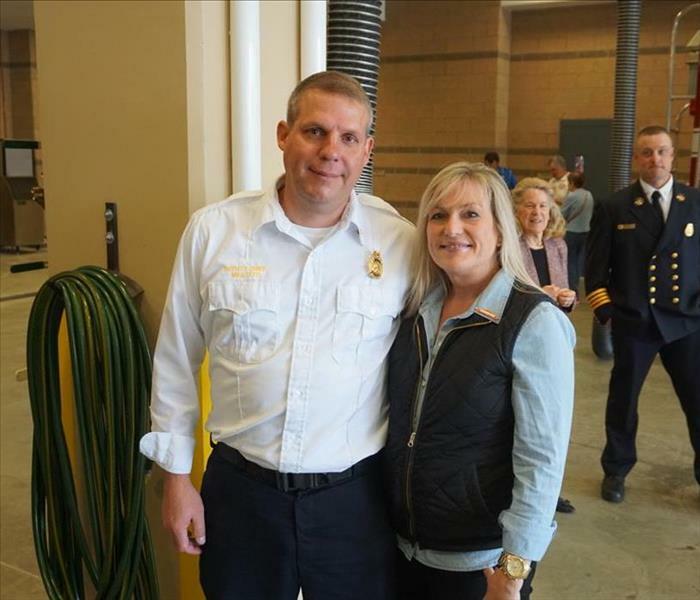 Dodi Millette, one of our best marketing representatives, poses here with her husband at the Grand Opening of a fire department in Greenwich, CT. We love to show our appreciation for all the fire departments in the area. 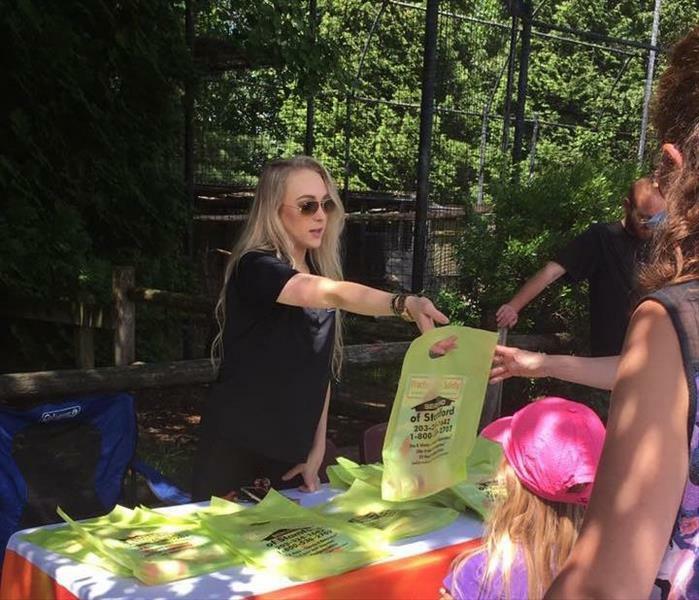 One of our summer interns, Dakota, hands out gift bags to passers-by at the Beardsley Zoo. Parents and children alike enjoy the sunshine and goodies. 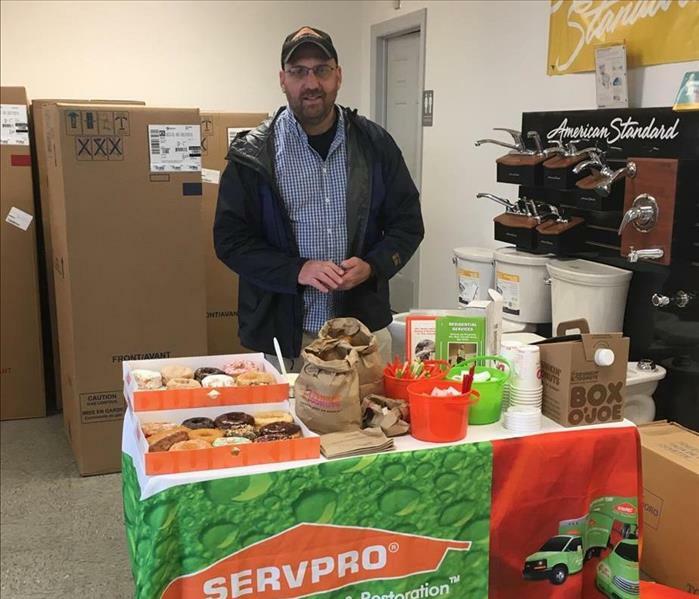 The Beardsley Zoo is a proud corporate partner of SERVPRO. One of our managers, Ken Liptak, talks with plumbers and other skilled workers over coffee and doughnuts. We like to give back to these people as a show of appreciation for all the hard work that they do. In one of our recent jobs, we were called in to remove water from inside a boat. While this was a request we do not get often, we were able to quickly and efficiently help this customer with their issue. Two of our team members, Henry and Andrew, on scene during a Red Cross Install-a-thon. 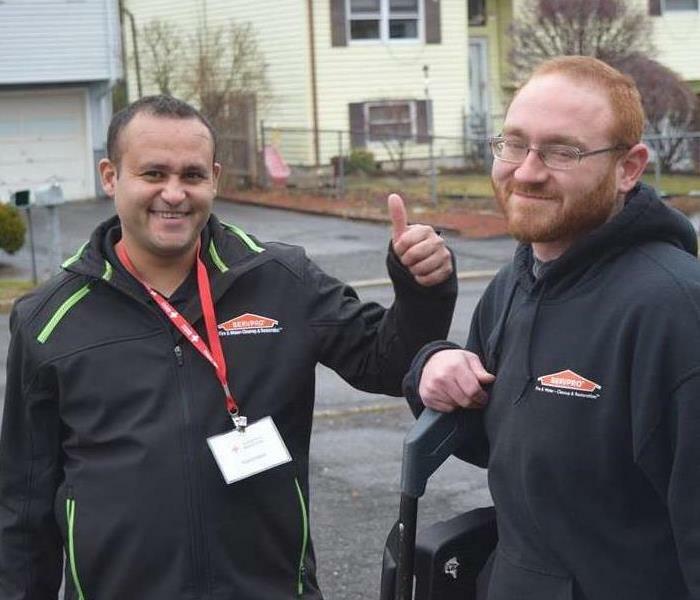 SERVPRO of Stamford helped the American Red Cross install smoke alarms in residences within the community free of charge. When we say 24/7 emergency service, we mean it! Here, we have one of our crews responding to a late night fire damage. We have crews at the ready for whenever disaster strikes. 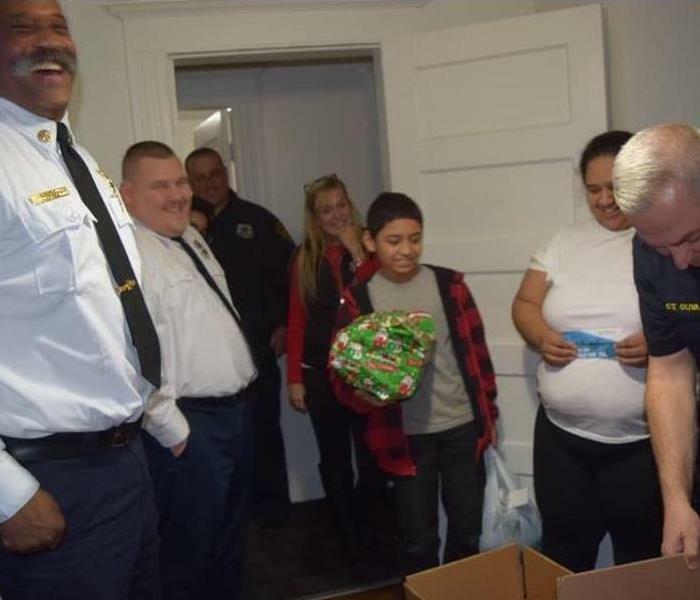 Our team member Dodi Millette accompanying the Bridgeport Fire Department as they deliver toys to families in need. This is an conjunction with their annual toy drive that is always a success in the community. 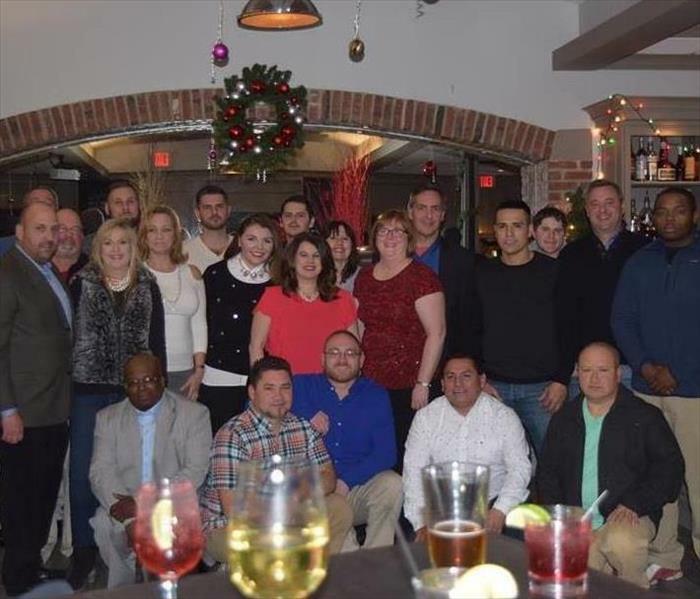 The SERVPRO of Greenwich team celebrating another year in the books. Our annual holiday party is always a great time for reflection and team building. It is also a great time to think about the coming year.